Cody Ray Allen Garbrandt was born in Uhrichsville, Ohio in 1991. He is the reigning defending UFC Bantamweight Champion. 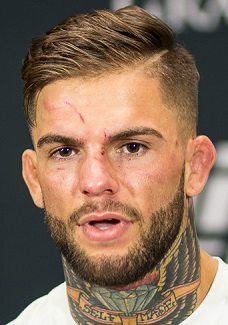 At time of writing, Garbrandt is undefeated in MMA. When he was 15 years old he started boxing. His boxing record stands at 31-1. He was also training MMA during this time. Cody Garbrandt made his amateur debut 2009 and had a total of 6 amateur fights, winning four and losing two. He made a successful pro debut in 2012 TKOing Charles Kessinger in the first round. 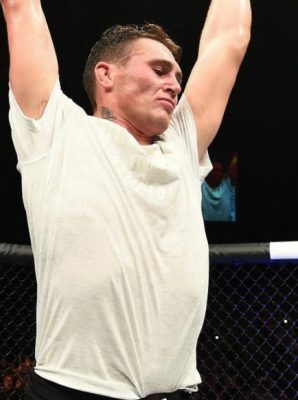 He finished four more opponents before he got the call to fight in he UFC. Cody Garbrandt made his UFC debut against Marcus Brimage and finished him by TKO in the third round. He went to a decision with Henry Briones before continuing his knockout streak. He finished Takeya Mizugaki and Thomas Almeida in the first round and got his shot against bantamweight champion Dominick Cruz. Cody Garbrandt faced Cruz who hadn’t been defeated in 9 years, with his last loss coming to Garbrandts mentor Urijah Faber. Garbrandt dominated the champion over five rounds and used Cruz’s tactics against him. Garbrandt will probably defend his title against former champ T.J. Dillashaw ad UFC 217 in Madison Square Garden in November.